The Anglo-Saxons developed a code of written law from native legal traditions. Like other germanic people, their law was written on a case-by-case basis, without any over-riding description of the concept of law. 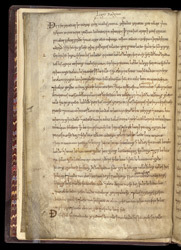 This page comes from a short section giving the Laws of Edgar (959-975), bound with other types of material such as recipes for medical remedies and later, 12th-century copies of the law. The medical remedies and this section of laws are thought to have been written at York, judging by the handwriting style but later were at Worcester.